Composer-pianist Richard Trythall studied composition and piano at the University of Tennessee, at Princeton University and at the Hochschule für Musik in Berlin, Germany. 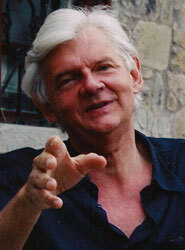 As composer he has received the Rome Prize in Musical Composition, a Guggenheim Fellowship, the Naumburg Recording Award, a Fulbright Fellowship, as well as composition commissions from the Fromm Music Foundation, the Dorian Woodwind Quintet, and the Gruppo Percussione Ricerca (Venice, Italy). His compositions, which include works for orchestra, for smaller ensembles, for solo piano and for tape (electronic works), have been performed at, among others: New York’s Carnegie Recital Hall, the Brooklyn Academy of Music, the Tanglewood Festival, the Aspen Music Festival, the Gaudeamus Festival in Holland, the Settembre Musica Festival of Turin, the Nuova Consonanza Festival in Rome, and the Darmstadt Festival in Germany. His percussion work, Bolero, has been danced by the Ballet Company of the Municipal Theater of Sao Paulo, Brazil, as well as by ballet companies in Italy, South Africa, and the United States. Recordings of his music are available on the American record labels, CRI and Aspen, as well as on the ReR Records (England), Minstrel (Italy) and Thorofon (Germany) labels.